The third of the 6 extended movie soundtracks issued by FTD. Each one has been released with an improved re-master of the original LP, plus alternate takes, and a colour booklet full of photos and information. It seems an odd marketing policy to release these CDs in groups of three, since not everybody can afford the luxury of buying all 3 at once. Plus many of us would have previously purchased them in RCA's "Double-Feature" series. Elvis' 12th movie, and his first 1960's film for MGM. At this point in 1962 good songwriters (ie Otis Blackwell & Don Robertson) were still interested in supplying Elvis' soundtrack material but unfortunately most of the other songs were plot based & lightweight fluff. To save money this time only Scotty Moore, D.J Fontana & The Jordanaires were flown in for the session at Radio Recorders. This is where MGM also insisted on that poor recording technique of placing the band on one tape track and separating off the vocals. This created a very basic, and usually dull, final mix that we are all familiar with. 'One Broken Heart For Sale' reached #11 in Feb '65. The soundtrack LP made #4. The single only ran 1½ minutes (why did they do that when the 'movie version' with the extra "Hey Cupid, where are you" verse ran 2½ mins?) and was the first Elvis single since 1956 not to make the Top Ten! 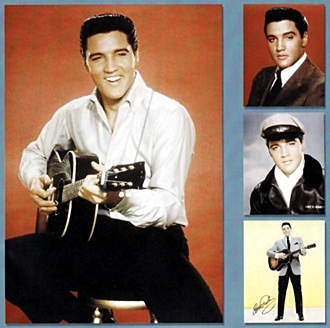 The LP was Elvis' shortest and dullest to date and yet reached the same position in the charts as his last studio LP, 'Pot Luck'. With Elvis' material becoming so comparatively bland, no wonder The Beatles made such an impact when they hit the charts. The CD is again presented in a beautifully printed deluxe gatefold sleeve looking very much like the original LP. The packaging, in a '45 rpm' size concept, is delightful and fits perfectly next to your Elvis 45rpms. The pictures include some rare candid photos as well as movie stills and also Cinema lobby cards. There are some informative notes including the fascinating fact that "Elvis wore no underwear during this period"! The audio mix on all the tracks has been spatially opened up to create a wide stereo sound (as much as the MGM basic original tapes allow) and it truly is "Living Stereo" as the logo infers. This allows all the musicians to shine and the overall feel you get it is that this was a great studio band being wasted on uninspiring material. However the new sound is still a treat to listen to and a track like 'Relax' is delicious with a nice clean bass sound. Elvis' previous LP was another soundtrack, 'Girls! Girls! Girls! ', and although 'World's Fair' was also recorded in 1962 it was a real indication that any of that early 60's musical spark was lost. However the updated audio re-mastering is excellent & hearing the musicians properly make even the lightweight songs a far more enjoyable listening pleasure than the muffled sound of the 90's 'Double-Features' issue. The original LP ran incredibly short, at less than 22 minutes (Side 1 ran under 10 minutes!) and it is probably only the presence of composer Don Robertson that gives the LP any interest. The first delight is the master of 'Relax' where you can now clearly hear some lovely jazz guitar work from Tiny Timbrell, along with the dual pianos of Dudley Brooks & Don Robertson. Adding Ray Seigel's nice walking-bass line and the shiny new percussion makes this a real joy to listen to. I'm sure that there is an excellent Elvis late-night Jazz/lounge music CD that could be compiled including 'Relax' and rarities like 'City By Night' and the outstanding 'I Need Somebody To Lean On'. The LP version of 'One Broken Heart For Sale' is also excellent to listen to in this new quality, the guitars having a much clearer mix, but it always did run far too short. No tracks were overdubbed this time so there are outtakes of every song (except 'A World Of Our Own' which was finished in one take. A few of the outtakes have already been released but there are still 22 new takes, or false starts, that have never been issued before. 'One Broken Heart For Sale' - Nice to hear the band working on this Otis Blackwell song. This confirms that the extra verse recorded for the movie version "Hey Cupid, where are you" was actually dropped from the recording rather than being edited out for the single release. Take 3 falls apart after 40 seconds with Elvis sounding quizzical and asking, "Excuse me. Would you just play that much back I want to hear something?" Take 1 the laid-back longer 'movie version' follows. Already on 'Collector's Gold' but sounding better here. "That's a Killer" comments engineer Dave Weichman at the end. 'They Remind Me Too Much Of You' - The exquisite Don Robertson song & with the composer playing piano. Take 1 is perfect & I have always presumed the background rumble (actually louder here because of the open mix than on EAP) was a Hammond organ. Take 4 has a very different mix with no organ and the guitars higher in the mix along with a delightfully light piano. Elvis is obviously enjoying the session as he laughs, "The bass singer is corrupting me!" before an absolutely gorgeous Take 7. While Radio Recorders doesn't have the ambience of Studio B in Nashville, take 7 shows off Elvis' vocal with a startling presence and you can hear every swallow and breath. The Mello Men backing vocals are also perfect. A gem. 'I'm Falling In Love Tonight' - On Takes 1-4 Elvis has problems with the count-in. These are already on the EAP silver box-set but great fun & in better quality here. Interestingly the sequence has been edited in a different order on this CD! The complete take 1 is the best version as the dominating Hammond organ of the final master has a much lighter arrangement. 'Beyond The Bend' - Surprisingly enjoyable for the slight song that it is. Take 2 at the slightly slower tempo and has a nicer groove than the faster master. There also is some great studio interaction with Elvis laughing about singing the wrong lyric, "Hop the grass is greener. Sure, sure!" He then falters at the same point on take 3 and at the end says, "Let me do one more." 'Cotton Candy Land' - A simple soundtrack song but Elvis still works hard for it. At the start of take 1 he quips, "Tempo's too slow fellows. This guy will never come at this rate." Take 4 is very similar to the master. 'How Would You Like To Be' - With songs like this, one really wants to hear Elvis saying "Why Am I singing this crap? Let's do a rocker!" Unfortunately he never did and, as everyone says, he remained totally professional whatever they asked him to record. Very close to the master. 'Relax' - These takes are different since they are binaural, with Elvis' vocal left channel only. At the start Elvis explains to D.J Fontana to follow his downbeat and there are terrific finger clicks on the right channel only. Elvis agrees that Take 5 is too slow saying, "It was a little slow on the finger-snapping." While Elvis is said not to have enjoyed 'jazz', this is just divine. The excellent dual pianos, the walking bass-line along with superb guitar work create a delicious, cool and jazzy vibe. Elvis' laid-back vocal & sighs work so well. Think of Elvis singing in a smoky nightclub and play it again! This is the real highlight. 'Happy Ending' - From the sublime to the happy fluff and this is binaural too. There is fun to be had in hearing Elvis mess up the lyrics and get exasperated. The clarity of the mix also means that you can hear Elvis putting his all even into a song as slight as this. He completes Take 6 but doesn't seem to realise that he gets the lyrics wrong, "Fate can play a part, and give a guy a real good cry." 'Take Me To the Fair' - Another light soundtrack song but here you can eavesdrop on Elvis in the studio. He sings the guitar part explaining, "Stay on it, so I can match it." He then laughs saying, "And then starts the rhythm, hot diggity!" Take 6 falls apart delightfully with everyone in the studio laughing together. Finally we get a rough sounding acetate of the earlier 'movie version' with added ukulele. In the film itself the band & The Jordanaires seem to be mixed out of the track. Verdict - The least essential FTD soundtrack so far, but due to the lack of quality in the original soundtrack rather than anything else. However, if 'It Happened At The World's Fair' is a favourite film of yours then there are still enough surprises to make this an enjoyable purchase and if you like the package, the other ones are even better! If you have ever enjoyed the happiness & fun of Elvis' movies then FTD's Special Edition Soundtrack series are well-worth exploring. EIN suggests you buy the essential 'Viva Las Vegas' and then continue with your favourite selection of Elvis' movies. CD Credits: Compilation Produced by Ernst Jorgensen and Roger Semon. Mastered by Lene Reidel.